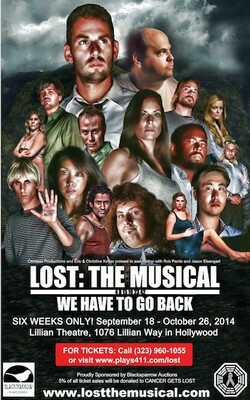 Lost The Musical - We Have To Go Back! Six seasons of TV's most beloved sci-fi drama packed into one night of hilarious musical absurdity. We Have to Go Back: A Lost Parody Musical is a musical parody our favorite cult hit TV show. Much in the vein of other parodies such as Fellowship, A Very Potter Musical, and Point Break Live, this play puts a humorous twist on a show that riveted us, shocked us and entertained us throughout the years. Six seasons (121 hours) of episodes are boiled down into 72 characters, played by 16 actors, across two and a half hours in one night of hilarious and wacky absurdity. We are among some of the biggest Lost fans alive on Earth, and believe that a story that meant so much to us deserves another chance to be told (albeit in a slightly different style). That's why we've produced what we hope will become the ultimate Lost experience for fans that want more! We take all the drama, chaos and mystery that we loved about Lost and have added tons and tons of humor to make the story new again.